From November 2015 to January 2016, a trial excavation was conducted at the hills, north of Horbat Sher in Modi‘in (Compound L; Permit No. A-7516; map ref. 198568–200253/643990–4656). 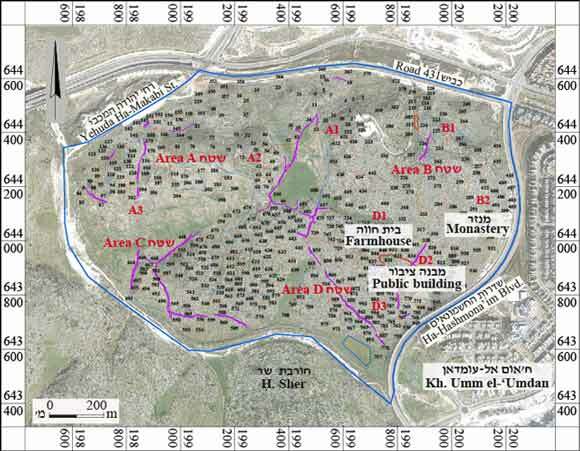 The excavation, undertaken on behalf of the Israel Antiquities Authority and financed by the Israel Lands Authority, was directed by E. Haddad, with the assistance of I. Kornfeld (preliminary survey, probe sections and logistics), Y. Elisha, L. Nadav-Ziv, O. Danziger and S. Bar (area supervision), Y. Nagar (assistant area supervision), Y. Amrani and E. Bachar (administration), M. Kahan, A. Hajian and M. Kunin (surveying), S. Ajami and A.Nagrin (drafting and surveying), A. Peretz and Y. Yolovitz (photography), Griffin Company (aerial photography), C. Ben-Ari and A. Dagot (GPS), D. Levi and L. Barda (GIS), S. Crispin (metal detection), P. Gendelman (scientific guidance), G. Stern, Y. Avivi and E. Mahal (guidance of volunteers), O. Rosenthal (farming terraces), E. Ayalon (ancient installations), O. Barzilai, A. Yaroshevich and M. Oron (prehistory), N. Marom (archaeozoology), J. Neguer and R. Abu Diab (conservation), I. Taxel (ceramics), R. Toueg, U. ‘Ad and L. Rosenblum (computerization of excavation file) and O. Paz (auxiliary sciences), as well as A. Shadman and A. ‘Azab. The excavation was conducted in an open, rocky area (c. 1.0 × 1.5 km, averaging c. 250 m asl; Fig. 1), where the Giv‘at Sher neighborhood is slated to be built in Modi‘in. The excavation area is bounded by Road 431 on the north, by a dry streambed through which Road 200 is planned to pass on the west, and by Ha-Ḥashmona’im Blvd. on the east. In the northern part of the area, which is mainly composed of bedrock outcrops, lies a large karstic depression (sinkhole) filled with agricultural soil. To its east is a high knoll, where a modern water pool was constructed. Four excavation areas separated by wadi channels were opened (A–D; Fig. 1), and 214 sites were documented. These included agricultural terraces, field-partition and enclosure walls, a dam, stone-clearance heaps, field towers, roads, pens, a rock shelter, limekilns, water cisterns and burial caves, as well as rock cuttings and hewn installations, including winepresses, cupmarks and basins (Table 1). A monastery, a farmhouse and a large public building occupied in the Byzantine period were also uncovered. Area A was divided into three areas (A1–A3); Area B extended over a high knoll (290 m asl) and was divided into two areas (B1, B2); the monastery was designated Area B2. Area C, which stretches across a gentle slope containing two low knolls, yielded most of the industrial installations, such as winepresses and pens. 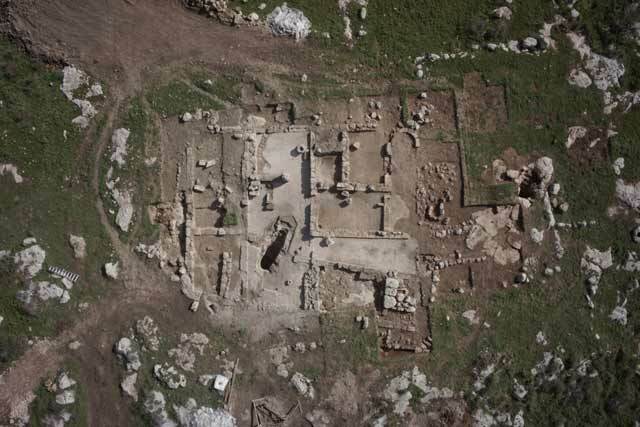 Area D was divided into three areas (D1–D3), where the farmhouse and the public building were excavated. The sites unearthed in the current excavation were discovered in a preliminary survey conducted prior to the excavation with the assistance of Y. Kornfeld, the documented approximately 950 sites, and found Byzantine pottery, a few Ottoman potsherds and flint scatterings from the Pre-Pottery Neolithic A period. The survey was based on a previous survey conducted in the region, which recovered flint items from the Pre-Pottery Neolithic A period and identified building remains, installations and potsherds from the Iron Age, Hellenistic, Roman, Byzantine and Early Islamic periods (Zbenovich, Barda and Haiman 2005). Overlooking the excavation area and to its south lies Horbat Sher, where remains have been unearthed from the late Hellenistic–Early Roman periods (second–first centuries BCE), the Byzantine–Early Islamic periods (fifth–tenth centuries CE) and the Mamluk period (fourteenth–sixteenth centuries CE; Farhi et al. 2009:139). To the south west of Horbat Sher stretches the site of Horbat Bet Shana, where remains from the Second Temple period were unearthed (Zissu and Bordowicz 2007). 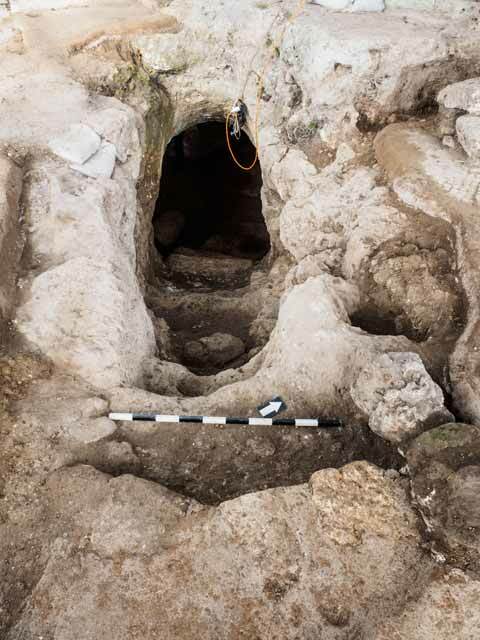 An excavation at Horbat Hammim, which extends to the west of the excavated area, yielded remains from the Pre-Pottery Neolithic A, Persian, Hellenistic and Byzantine periods (Haddad 2017). Four Second Temple-period tombs were discovered in the past at the foot of Giv‘at Sher and to its north (Kogan-Zehavi 2009). To the east of the excavation area, along Ha-Ḥashmona’im Blvd., a section of a road that was in use from the late Hellenistic period through the Byzantine or Early Islamic period and several dams built in the wadi have been documented (Torgë 2000). To the east of the road, southeast of the excavation area, lies the site of Kh. 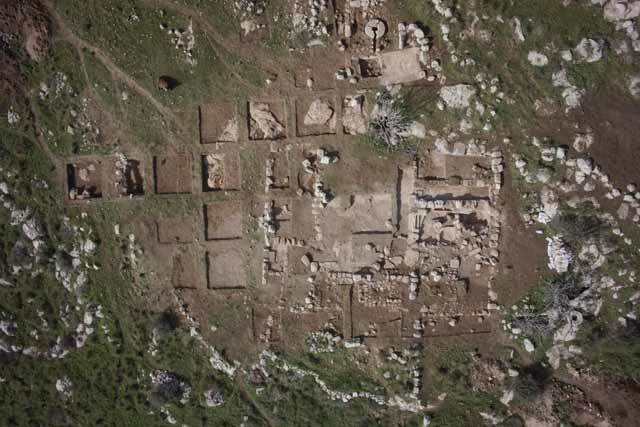 Umm el-‘Umdan, where remains of a settlement and a synagogue from the Second Temple period were excavated (Onn et al. 2002; Weksler-Bdolah, Onn and Rapuano 2003; Weksler-Bdolah 2014). The Monastery (15.0 × 18.5 m; Fig. 2) was unearthed on the southeast slope of the knoll in Area B2. Its walls were built of ashlars and some of its rooms were paved with white mosaic, and others — with plaster (Fig. 3). A monumental threshold leading to a rectangular courtyard paved with white mosaic was uncovered in the east wall of the monastery. A design of what may be a cross (Fig. 4) is depicted at the center of the courtyard mosaic floor. An eastward-facing apse was discovered in one of the rooms, which probably served as a chapel. Next to this room was a stone lintel bearing a relief of a cross(?) resembling that in the courtyard mosaic. A large pile of collapsed building stones in another room included rectangular bases with grooves for the installation of a chancel screen. An elliptical entrance to a natural cave (8.0 × 9.5 m; Fig. 5) was uncovered in the center of the monastery. Several of the steps leading down into the cave were hewn, and others were built of stones (Fig. 6). Only the northern part of the cave was excavated, and its excavation was not completed, and a pit was dug by antiquity robbers in the western part of the cave. The cave contained an enclosure built in the Ottoman period; it sealed a Mamluk-period floor made of dressed paving slabs that had near the staircase a pit with traces of fire. A small collapsed column found to the south of the paving may once have stood near the entrance to the cave. The cave was the earliest of four building phases identified at the monastery. Rock-cuttings on the rock outcrop over the cave belong to a later phase. These cuttings were annulled when the monastery was built in the Byzantine period. During the final building phase, the monastery’s courtyard was rendered obsolete or divided up by a wall constructed within it, possibly in the Early Islamic period. The Farmhouse (Fig. 7). 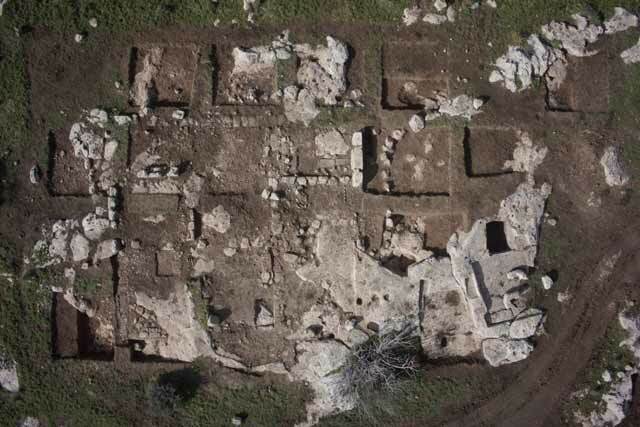 A Byzantine farmhouse (c. 15 × 15 m) comprising nine rooms and at least two construction phases was unearthed in Area D1, c. 500 m southwest of the monastery. Its walls, preserved to the height of a single course, were built of ashlars and utilized the bedrock. Some of the rooms yielded beddings for mosaic floors. The Public Building (Fig. 8). 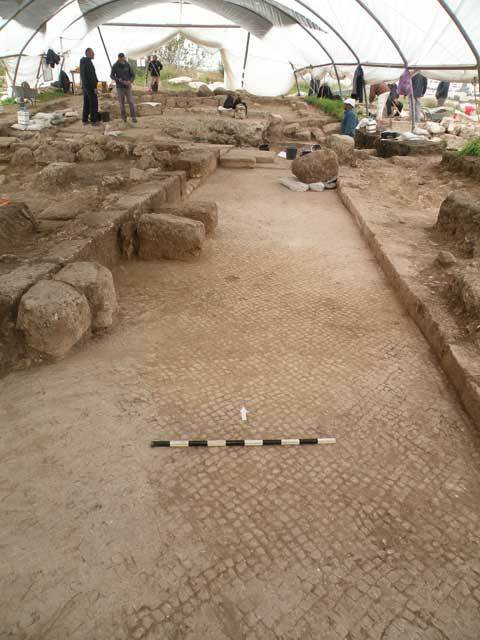 Part of a building (18 × 24 m) unearthed in Area D2, southeast of the farmhouse, comprises a central courtyard surrounded by rooms and cisterns; the courtyard was paved with a coarse, white mosaic. One of the rooms to the north of the courtyard had a cellar (Fig. 9). A threshold stone with hewn sockets was found set in the cellar’s south wall. From the threshold, two elongated rock-hewn steps led down to an intermediate level. A massive collapse of building stones, including ashlars and voussoirs, found on this level indicate that it was roofed with arches. Mosaic tesserae recovered here may have come from the floor above the cellar. A large circular stone basin that probably served as a baptismal basin was discovered on this level. A rectangular installation (c. 2 × 3 m), divided into two parts, was hewn into the west wall of this level. A tethering hole in the installation’s south wall suggests that it comprised two troughs, one for fodder and the other for water. The troughs may have been used in a later phase of the building. 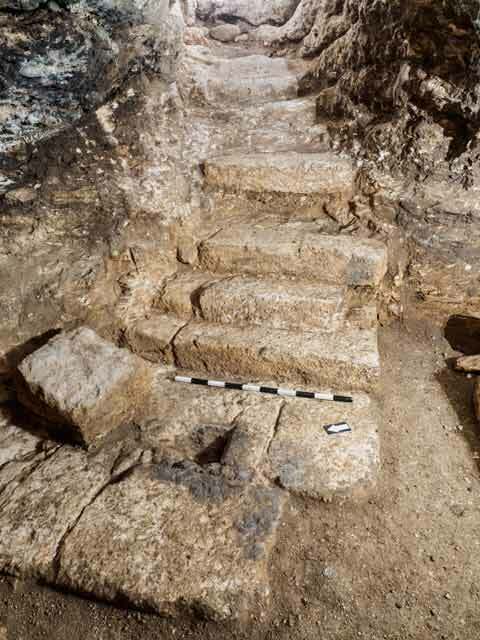 A probe excavated in the northwest corner of the intermediate level revealed a stone-built staircase leading to a lower level in the cellar, with hewn bedrock walls and a floor paved with large stone slabs. Two crosses were engraved on the walls. Pottery from the Byzantine period was discovered inside the building and in its vicinity. A winepress unearthed to the west of the building contained mosaic paving and a plastered collecting vat. To its north, a section of a road running from northeast to southwest was discovered. The excavation finds attest to extensive activity at the site in the Byzantine period. The discovery of the monastery is an important addition to our understanding of the Modi‘in area population during this period, and it attests to the monastic presence in the area. The monastery, farmhouse and public building, which were built nor far from each other, operated within a single habitat during the same period and provided each other with reciprocal services. The crosses discovered within them show that they were occupied by Christians. The monastery overlooks an ancient road running to its east (today’s Ha-Hashmona’im Blvd. ; Torgë 2000) as well as the sites of Umm el-‘Umdan, Horbat Sher, Horbat Bet Shana and Tel Gezer. 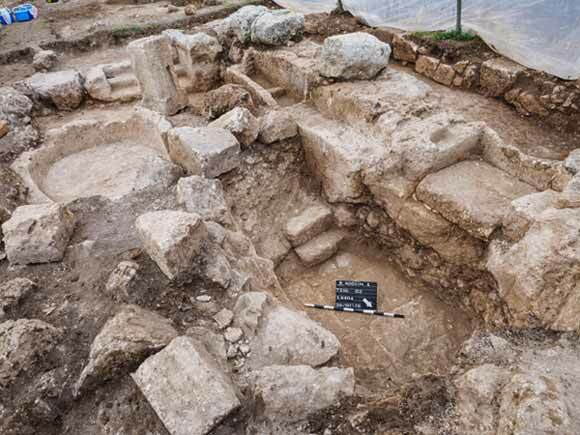 Despite the proximity of the excavation area to Umm el-‘Umdan, where finds from the Second Temple period have been recovered (Onn et al. 2002; Weksler-Bdolah, Onn and Rapuano 2003; Weksler-Bdolah 2014), no finds from this period were found in the current excavation, with the possible exception of a burial cave (F771) discovered on a spur ascending northward from Umm el-‘Umdan. This cave may be associated with tombs discovered nearby (Kogan-Zehavi 2009). Haddad E. 2017. Modiʽin, Horbat Hammim. HA-ESI 129. Kogan-Zehavi E. 2009. Khirbat Umm el-‘Umdan, Horbat Hammim. HA-ESI 121. Onn A., Weksler-Bdolah S., Rapuano Y. and Kanias T. 2002. Kh. Umm el-‘Umdan. HA-ESI 114:64*–68*. Torgë H. 2000. Umm el-‘Umdan, Route 2 (Center). ESI 20:88*–89*. Weksler-Bdolah S. 2014. Kh. Umm el-‘Umdan. HA-ESI 126. Weksler-Bdolah S., Onn A. and Rapuano Y. 2003. Identifying the Hasmonean Village of Modi‘in. Cathedra 109:69–86 (Hebrew). Zbenovich V., Barda L. and Haiman M. 2005. Modi‘in, Development Survey. HA-ESI 117. Zissu B. and Bordowicz Y. 2007. Horvat Beth Shana – An Ancient Site from the Second Temple Period and the Bar-Kokhba Revolt in the Northern Judean Shephelah. In Y. Eshel ed. Judea and Samaria Research Studies 16. Ariel. Pp. 265–283 (Hebrew; English summary, p. XIX). 2. The monastery, looking east. 3. Mosaic paving in monastery, looking north. 4. 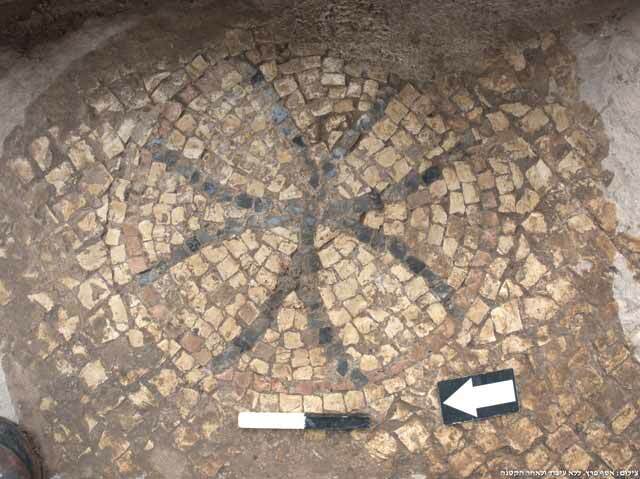 Cross motif in mosaic pavement, looking east. 5. Cave entrance, looking west. 6. Steps leading to cave, looking east. 7. The farmhouse, looking west. 8. Aerial view of the public building, looking west. 9. Cellar in the public building, looking southwest.